‘I was gripped immediately’ KATERINA DIAMOND, author of THE TEACHER ‘Terrific characterisation, great writing and twists to leave you dizzy.’ TERESA DRISCOLL, author of I AM WATCHING YOU Do you really know your friends? ** THE TOP 10 KINDLE BESTSELLER** On the afternoon of Nick and Lisa’s wedding, their close friend is found poised on a hotel window ledge, ready to jump. As the shock hits their friendship group, they soon realise that none of them are being as honest with themselves – or with each other – as they think. 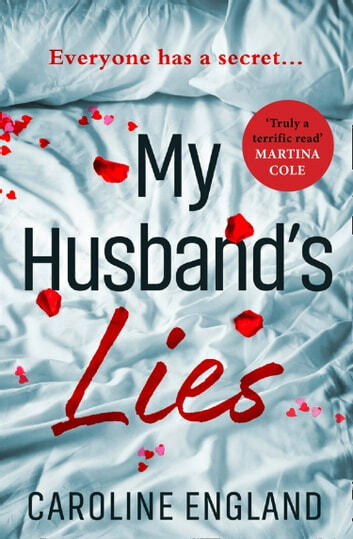 And there are secrets lurking that could destroy everything.Tense, disturbing and clever, My Husband’s Lies is a breath-taking read, perfect for fans of Lucy Clarke and Erin Kelly. 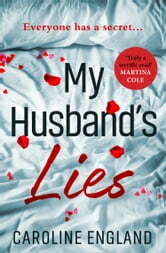 I really loved reading My Husband's Lies. The number of characters made it a little confusing to work out initially how they all fitted together. Despite many knowing each other for years they all held their own secrets - hidden from each other as well their spouses and family. As their secrets are disclosed the suspense builds and I couldn't put it down. Makes me wonder what secrets my friends might be hiding. Looking forward to reading Caroline's previous book Beneath the Skin. A well written story of couples connected by lifetime friendships. Wow what a read. I couldn't put this book down. The intricacies of the characters were so well written it seemed like I knew them personally. I just loved the way each couple was portrayed and the skeletons hiding in the closets. Loved this book. Was okay a bit hard to get into . Ending a bit disappointing but that's my opinion. Over all a okay book but wouldn't read again .